Home / Market Insight, Financial Articles / Gadgets, Smartphones & Tech / Is Apple Inc. (AAPL) Preparing a Red iPhone 7? Apple Inc. (NASDAQ: AAPL) faces a challenge over the next six months. There’s an all-new iPhone 8 expected in the fall. And rival Samsung Electronics Co Ltd (OTCMKTS:SSNLF) is expected to pull out all the stops with a comeback Galaxy S8 in coming weeks. With the threat of AAPL fans holding onto their cash for the new iPhone and the risk of Samsung getting all the attention, how does the company keep sales of the relatively pedestrian iPhone 7 humming? It sounds like AAPL may fall back to one of its favorite strategies: release a new color. If Japanese Apple blog Mac Otakara is correct, we could see a red iPhone 7 in March. AAPL is accustomed to cyclical fluctuations in its iPhone sales. The numbers tend to slow in the lead-up to the fall, when the new iPhone model is due to be released. However, this year, a confluence of factors could make that slowdown much more pronounced. The biggest factor is the iPhone 8. With the current iPhone 7, AAPL is winding down its first three-year product development cycle. That means the iPhone it’s trying to convince people to buy for the next six months looks virtually identical to the iPhone 6 and iPhone 6s. That can already be a tough sell, but the iPhone 8 isn’t only the start of a new cycle — meaning it will look different and offer some compelling new features — it’s the 10th anniversary iPhone. Everyone is looking to Apple to make a splash. Why would you buy a plain Jane iPhone 7 now if the completely new (and possibly radically new) iPhone 8 is just months away? Then there’s the Galaxy S8. Samsung is Apple’s traditional rival for selling premium, flagship smartphones. After having its reputation — and smartphone sales — torched by the Galaxy Note 7’s exploding battery crisis, Samsung is looking to the Galaxy S8 to mark its comeback. That is going to make things tougher for Apple over the next six months when it comes to attracting fence sitters, upgraders and those buying their first smartphone. The Answer Is … A Red iPhone 7? Apple doesn’t have many options here. It could cut iPhone 7 prices, but AAPL never does that. It could push up the iPhone 8 release, but that has many risks. Instead, Mac Otakara is suggesting Apple will go to one of the oldest strategies in its marketing bag: a new color. And not just any new color. The blog (which has a reputation for getting a lot of these prediction right) is suggesting AAPL will release a red iPhone 7 in March. Apple has a long history of introducing new colors as a low-risk, low-cost way of generating new interest in products that are getting long in the tooth. It perfected this strategy with the iPod line-up, that would get a rainbow of new colors every year. It has done so in a more subdued way with the iPad and MacBook, adding new variations like Rose Gold. It actually used the strategy once already with the iPhone 7, introducing a glossy, Jet Black option at launch. 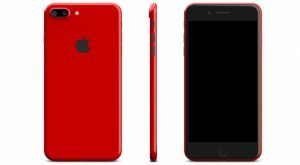 A red iPhone 7 would be the first time Apple has released such a bold color for its smartphones. I mocked one up using the skin generator from ColorWare, a company that has been successful at marketing flashy new appearances for a wide range of consumer electronics. There’s no doubt, a red iPhone 7 would be a looker. Apple could even release such a device under its (PRODUCT)RED banner. This is a series of red Apple products that contribute toward a global fund to fight Aids. Most of these are accessories, but a red iPhone 7 would fit right in and offer the advantage of letting AAPL promote the smartphone as part of the (PRODUCT)RED initiative, making it seem less like a marketing ploy. According to Mac Otakara, we should see the red iPhone 7 make an appearance in March, at an event where AAPL is expected to refresh its iPad Pro lineup. Will a bold and shiny new color be enough to keep iPhone sales humming in the lead-up to the iPhone 8? That’s a good question and one that will have a material impact to Apple’s bottom line this year. AAPL has few other options and it sounds like the company may be willing to roll the dice with a new red iPhone 7. Article printed from InvestorPlace Media, https://investorplace.com/2017/02/apple-inc-aapl-stock-boost-sales/.